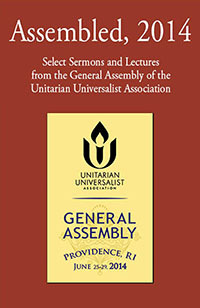 The major presentations of the 2014 Unitarian Universalist Association General Assembly (GA). The theme of this year's GA was "Love Reaches Out," inviting Unitarian Universalists to consider ways that we can carry our faith beyond the walls of our bricks-and-mortar congregations and engage in new ways of sharing our beliefs and values with the wider world. We gathered in Providence, Rhode Island, to talk about the future of Unitarian Universalism and the opportunities of challenges of liberal religion in the twenty-first century. UUA President Peter Morales says, "I invite you to take time to read and reread these profound addresses—even if you were at GA and attended each of them. Share them with others and discuss them. There are wisdom and inspiration here that beg to be shared." Includes the Berry Street Essay by Rev. Lindi Ramsden, the Fahs lecture by Rev. Mark Morrison-Reed, the Ware Lecture by Sister Simone Campbell, and sermons from the Service of the Living Tradition (Rev. Rebekah Montgomery) and the Sunday morning worship service (Rev. Mark Stringer).